It’s taken a while, but the startup world is starting to recognize the power of building an audience before building a product. That’s music to our ears. That’s the way our company grew out of a one-man blog. Back in 2012, while chronicling how that happened, I coined the term minimum viable audience, effectively tying content marketing to the lean startup movement. A case study on Copyblogger Media in The Lean Entrepreneur brought the message to a wider audience of entrepreneurial hopefuls. Now, my friend Joe Pulizzi is dedicating an entire book to the subject, which may well provide the tipping point. It’s called Content Inc., and today Joe joins us to provide the methodology that many, many companies have used to turn an audience into successful products and services. Plus, Joe shares several examples of companies you may have never heard of that have used content as the catalyst for a startup business. Brian Clark: Hey there, everyone. Welcome to another episode of New Rainmaker. I’m your host, founder and CEO of Copyblogger Media. Today, we have yet another very special guest, Joe Pulizzi, or as I refer to him, the guy who I can’t outrank for the term ‘content marketing.’ I’ve been trying, Joe. You know I’ve been trying. Did you make up that word? Did you make up the term ‘content marketing?’ Was you it? Joe Pulizzi: And I love you. It excites me that you tried so hard to get down first. I really dig that about you, actually. Brian Clark: I do have a competitive streak. I can’t help it. Joe Pulizzi: Did I make up the term? I started using it when I was running custom media at Penton Media in 2001. Actually, the backstory about that is, we were in the custom publishing industry, and we were called ‘Penton Custom Media,’ two very boring terms. You go with ‘custom publishing at Custom Media,’ nobody wants to buy anything from you. Yeah. I can’t prove it. I can’t prove that I was the first one, probably as much as you were responsible for popularizing it, because you didn’t like the term, but then you started using it. I said, “Thank Jesus for that.” It helped us. But it was you who convinced me, and grudgingly, I guess, and I don’t know what my issue was with it. I don’t even think it occurred to me that it needed to be called something. But for those of you who don’t know who Joe is — you probably do — he is the founder of Content Marketing Institute, the world’s leading enterprise solution provider. No, I’m trying to come up with a tagline for you. Joe Pulizzi: “Leading training and education company for enterprise marketers,” something like that. Brian Clark: Exactly. According to Google. Joe Pulizzi: Hey. If Google said it, it must be true. Brian Clark: It must be true. Brian Clark: Also, more impressively, is that Content Marketing World, without doubt, is the largest and the finest content marketing conference out there. It’s something I’ve been involved with every year since the beginning. Joe Pulizzi: Every year, that’s right. Brian Clark: It’s so aimed at the enterprise. Why am I there every year? Joe Pulizzi: Because everybody aspires to be a big company. It’s interesting. You know this, because I think we’ve had some conversations on when you target the enterprise, you can’t target the mid market. You actually have to say ‘enterprise,’ and you get the mid market. Then you get small companies that actually want to aspire to be big, so then we got a lot of really high-growth small businesses. That’s what we target. So you get mostly marketers at large businesses, and because of that you get the mid market, and then you get the small businesses that want to be big. It’s just interesting. That’s why you fit in. You probably target what, the growing small business, mid-market audience? Would you say that that’s your target? Brian Clark: I think a lot of our customers fall into the biggest group of the small business market, which is the very small business, but it does move up from there. Brian Clark: I think, again, a lot of the work you have done has made what we talk about relevant to even larger companies. I think our hearts are with the small companies, because that’s our affinity. But the information percolates all over the place, which is fascinating to me. Let’s get to the issue here, because historically, an enterprise-focused institute and conference, and now you’ve written Content Inc., which is squarely aimed at the startup and small business world, the whole audience-first theme that we’ve been talking about for years. I was fortunate enough that you allowed me to write the foreword to the book. As long as I get in somewhere. Joe Pulizzi: ‘Allowed’ is a good way to put it. It defaulted to you. You had to write that because it’s your story. Thank you for that, by the way. Brian Clark: Yeah. It’s a great book. It’s going to be out in just a few weeks here. It’s available for pre-order, called Content Inc. There’s also an excellent podcast that Joe’s been running called Content Inc. also. How do you like that? Let’s talk about podcasting. Everyone is doing podcasting now. You’ve taken to it. I love your show with Robert, This Old Marketing. How has it been reaching out to this new audience with a podcast? Because it seems like that’s your primary engine. Joe Pulizzi: This is all a big experiment. Actually, everything is, even writing the book to this audience. Because as you said, we’ve never targeted the small business, startup, entrepreneurial audience, so to start with that was completely selfish on my part, because I wanted to write this book. I literally said, “This book needs to be written. What we’ve done at CMI, what Brian’s done at Copyblogger Media, and dozens and dozens of other examples, they need to be told, because we have to get away from this idea that you have to be a big company to do this thing called content marketing. I started to do the same thing with podcasting. So I started to write episodes of the podcast, which became chapters of the book. I started to release those, edited them down, and then we’ve got part of the book done. As I’ve been going through and doing this podcasts — two a week, and they’re really short, like five to seven minutes long — then okay, I’ve got more content for the book. Joe Pulizzi: I think you just give it all out as much as possible. Build some anticipation over it. Build your audience so that when you release the book, it’s already there. The audience is basically your customer list for buying the book or the audio book. It’s all ready to go. 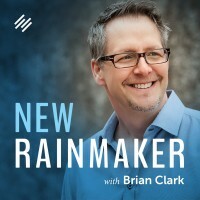 Brian Clark: You’re demonstrating the principle of the book in a way that you’re building an audience to sell the book. I like that. You’re getting very meta, Joe. That’s been our thing for years. Joe Pulizzi: My life is meta. Joe Pulizzi: We’ll see if it works out. So far, it looks like … We’ll know right away. September 8th, the book comes out. It comes out at Content Marketing World. I think we’ll know within the first two weeks if that strategy has paid off. Fingers crossed, it looks like it will work. Brian Clark: Well, I’m certainly going to help, because again, my foreword cannot be unseen. I mean, I must have spent 20 or 30 minutes on that Joe, and you had to write the whole rest of the book. Joe Pulizzi: It could go down as the greatest foreword in business history. I never came out and said it, and then right after I asked you to be on the show, I see you’ve written an article saying ‘Why Startups Basically Beat the Pants off the Enterprise at Content Marketing.’ I mean, the headline was something to that effect. Tell me what you think about that. Joe Pulizzi: I totally agree with that. It’s the premise of the book. I’ve spent too long — 16 years now — working with these large companies. There are so many politics, red tape, fiefdoms that you have to deal with, meeting after meeting to get something done. Culture change has to happen of some nature, or you have to have a content champion that’s so strong that it’s actually willing to risk their job, at least doing it the way that it’s been done, to make some of these decisions to say, “Look, we’re not going to market the way we’ve always marketed. We’re going to go out and build an audience that knows, likes, and trusts us, and if we do that, we believe in our heart of hearts that it’s going to help our business, and here’s how.” Basically, that’s the approach. There are very, very few large businesses that can do that, because they’re so set in, “We have these products to sell. That’s what marketing’s for. Get the darn brochure done, set it, and make sure the sales people have what they need. Marketing, get out of my way, and I’ll sell.” Especially in large B2B companies. Now what we notice is, if you have a belief structure around the practice of content marketing, that you really believe that this is the way that you can go to market, you have one person that could make that decision. And you have such other focus on a content niche, which is also another issue with large companies. They want to target every one of their buyer personas, audience personas, and in a B2B company, that could be seven to nine people, and then their content becomes so irrelevant, it doesn’t do anything. But if you’re a startup, you’re focusing on that audience — building that audience, focusing on that person and that audience that you’re building — that becomes your future customer database. It takes time, and it takes patience. Large companies have no patience. Large companies — usually the ones that we work with — are public companies. They’re on some kind of a quarterly fiscal financial release schedule. Nobody has patience for anything. Brian Clark: It’s amazing, the short-term thinking at the largest institutions on the planet, because it’s this quarterly mentality. I know there’s so much money at the enterprise level, but I’ve never wanted to deal with what you described, that mire of entrenched silos and infighting and the inability to move quickly. That’s also why I refer to myself as ‘unemployable.’ Could you imagine me in that environment? I’m on the evening news at some point. Joe Pulizzi: We just had our team meeting, and we were talking about it being a noble effort. This is a mission that we can really get behind, because who’s going to do this? Who really cares about this? There’s a lot of really good people and marketers in these large companies that are struggling, and that’s our job to support them and to give them the air cover so they can go in and make change happen. If you can make change happen — a good example is Julie Fleisher of Kraft. The change that she’s made happen in Kraft has been phenomenal. I don’t even know how much they respect it inside Kraft, but she’s so respected outside, and she’s an inspiration for marketers at large companies all over the place. Because we know it can be done, and we know that that is a real asset inside that organization that’s valued. We need more of that, because it’s the large companies that have large access to these large audiences that can actually help the world communicate better. Because we all know that we don’t need another ad. Do we need more advertising campaigns? For that matter, do we need more content campaigns? Brian Clark: No, it’s not a campaign. It’s a shift in thinking. Joe Pulizzi: What is a content campaign? I didn’t even know what that is. Is that a short-term content viral burst? Brian Clark: Do magazine publishers have ‘magazine campaigns?’ No, they produce a magazines. It’s more that type of thinking than it is a campaign. Joe Pulizzi: Well, yeah. “We’re going to go do a blog.” What the hell? What does that mean? We need, “Oh. Somebody get content for the blog today. Today we have to do a post.” What? Brian Clark: You know what occurred to me, when I heard you were writing a book and thinking about the audience you have? A lot of the enterprise people will send certain designated people from the marketing department or corporate communications or what have you to events like Content Marketing World. They’re in charge of figuring out this content thing. Then these people come back, and they’re inspired. They’re fired up. They know what to do, and they know what will work if they can get internal buy-in, and it doesn’t come. Has it occurred to you that some of those people in the existing audience may be looking at Content Inc. and thinking, “You know what? I know how to do this. I’m going out on my own.” To me, that would be fantastic. Some of the enterprise companies out there may not think that’s so great, but have you thought about that? Joe Pulizzi: The dirty little secret that’s going on in our industry right now is you have a lot of really smart people in big companies that understand how to build audiences, that don’t get quite the respect they deserve or need or even support. And yes, frankly, I’ve never seen — and I’m not saying any names, because we won’t do that, no names please — there are a lot of people that you and I know right now that are dissatisfied at their corporate job, and they want to do something for the greater good. They want to do something for themselves, and they want to do something for their families. And they know that they can go build an audience if they have the level of patience and determination and passion. They’re going to get there. To answer you, that’s a long answer to your question, but yes, absolutely yes. Brian Clark: But I mean, how could it not be? Joe Pulizzi: This is our future entrepreneurs. And they are going to Content Marketing World. That’s why Robert Rose and I, we’ve kicked around, “Hey. You know what, are we going to do like this startup thing around, because we see so many of these possibilities of companies launching from these corporate marketers that really want to be entrepreneurial.” Because they’re already entrepreneurial. If you’re a content marketer, you probably have that entrepreneurial spirit already, because you have to in order to survive in a large company atmosphere. Brian Clark: Yeah. That’s why my new project is aimed at the power of the small, the power that a media producer mindset could bring to a startup or even a production-style environment. And you hear all the things that are threatening or radically changing the future of work, including automation, robotics, computerization. But it’s also just the dissatisfaction with how large companies work, and I think there’s a big movement coming. I think content may be the catalyst in a lot of ways, because the light bulb has gone off, as you’ve mentioned, for a lot of these people that are like, “Wait. I can do something here without a lot of money, with all these tools that are out there and just the freedom to do it correctly.” I think that’s awesome. Joe Pulizzi: It’s the golden age for entrepreneurship. Right now. And I think that the whole content movement and the ‘no barriers to entry’ in the technology area and ‘we’re all publishers.’ It’s all the same thing. We can all do it. Everybody talked — even Peter Thiel in Zero to One, the book. Even though I love what he’s done: investor in Facebook, co-founder of PayPal, and he wrote a great book called Zero to One. But it starts the same as every other startup book. “You have to create a product that’s different than anyone else …” You know how hard that is to do? Brian Clark: I know, and what we were talking about last week with Robert was that content, media, is the last way to truly differentiate. I can manufacture anything I want in China. I can copy any service model. It’s this unicorn thinking that drives me crazy. Joe Pulizzi: It’s not a new concept either. I mean, Don Schultz, who is one of my heroes, the father of integrated marketing. I read an article that he wrote in 2003 in B2B Magazine. B2B is no longer around – well, it’s part of Ad Age, but the magazine’s gone now. He wrote and said, “Look. Everything that you are creating as a business, as a commerce-backed business, can be duplicated except for how you communicate.” He said it, and here we are. You’re talking about it. I’m talking, Robert — we talk about that all the time. But now, the difference is that you actually have more power to make change happen through content, because you can communicate directly. You don’t have that power 20 years ago. You had to have some kind of budget behind you. You don’t have to have that today. Brian Clark: Yup. Preach, brother. This is the choir over here. Amen. Joe Pulizzi: Preach it. Amen. Brian Clark: All right. Let’s talk about some examples of companies who have done this. Now, there are a lot of companies that are really well-known to my audience. I think we do owe them acknowledgement here, because a lot of our peers have done what you’ve done and what I’ve done. We all have different businesses, and maybe we ended up with a different answer about, “What problem or desire am I going to solve?” and yet fundamentally, the mechanism that you lay out in Content Inc. is the same. Joe Pulizzi: It’s the same thing. It’s basically, focus on who that audience is going to be. Figure out what your passion area is, mixed with what is something that you actually have authority — you like to use the word ‘authority’ — to communicate on? What’s that content differentiation area? We call that the ‘content tilt.’ Then build that base. Build that audience over time. Some of the examples, of course we use the Copyblogger Media example throughout the book. We use the Content Marketing Institute example. We basically did the same thing, but we monetized it through different ways. You monetize that through the products that you sell. We monetize that through mostly our events, like Content Marketing World. You’ve got Moz, Rand Fishkin, who did the same thing. He built 100,000 email subscribers and made the pivot from the consulting business to selling products. We know the folks at Social Media Examiner have done the same type of model, where he monetizes his through mostly online products and services. So there’s the ones I think we know about. The ones that we talk about in the book that we don’t know about, which I think are so interesting. If you look at somebody like Michelle Phan, who was a designer online, started a blog in 2005, started to build an audience, launched her books in 2010, launched her Pinterest page in 2011. She has now something like 13 million followers on Pinterest when it comes to all the designs she shares. I actually get her email newsletter, believe it or not. Now she’s got licensing, merchandising deals with Target, with Microsoft — a multi-millionaire. It’s just amazing what has happened by building an audience. So she created — and Andrew Davis, author of Brandscaping, tipped me off to this one — a video show, a regular video show, called ‘The 60-Second Super-cool Fold of the Week.’ Just to think that you don’t have to have a lot of audience or subscribers to do this, she built her subscribership up to 3,100. So you might be thinking, “That’s not that much.” For a B2B audience, that’s a good, solid audience. She’s been able to get about a million views of her videos over that time, and she’s been able to rack up well over $500,000 in direct revenue because of the videos. By the way, that was an existing business, so she’s trying to figure, “Okay. How do I take an existing business concept and add in what we know as the Content Inc. model to that?” And that’s worked really well for her. I’ve got a lot of good ones. I love what Ann Reardon’s done, the baking queen of Sydney, Australia. Basically, in 2012, she was up late at night. She had a baby, and she was doing night feedings. She got bored. She was a qualified dietitian at the same time, and she created a blog called How to Cook That, and she did regular videos. But her content niche, or her content tilt, was around impossible food creations. I don’t know if you remember, did you see the video of the Instagram cake? Brian, did you see this? Brian Clark: No. I didn’t see that. Joe Pulizzi: You are the only one that didn’t see it. Brian Clark: You know me. I have to work for a living. Joe Pulizzi: Basically, the outside looks like a chocolate cake, and you cut into it, and it was a replica of the Instagram logo. She did that inside the cake. It got millions and millions of views, so she went from 100 subscribers in 2012, to now, she’s got 1.7 million or something like that subscribers. Sixteen million views. I think her monthly view level is 16 million. It’s unbelievable, and Ann has been able to transform her business. She’s got licensing deals going on, promotional deals, merchandising deals. It’s just amazing. The other thing you don’t think about when we talk about the examples — and you’re probably the best example of this, but I do a little bit on this as well — is the number of different ways you can monetize the platform. The average is like five to six different ways that people do. It’s like “Oh hey, I’m selling this product.” Well if you have a Content Inc. model, and you create a platform and an audience that knows and loves you, you could sell lots of different stuff. That’s what we see on all the examples we cover in the book. It’s like an average of four or five or six different ways. Like at Content Marketing Institute, we monetize in like 10, 11 different ways with different products we have. I think you guys probably have what? Four or five? Joe Pulizzi: When you look at it with the event, and the sponsorship, and the products that you sell, and the affiliate stuff. I mean, you’ve got a little bit of everything going on. You almost think about consolidation at some point, but as long as this thing is something that satisfies the problem or desire of the audience, they’re going to be inclined to work for us hosting. We got into that really to build the hosting component of the Rainmaker Platform, but that was the hosting that Copyblogger uses for its own site. Some people are like, “Sign me up.” You know, we didn’t even push it hard, so yeah. It’s amazing. Joe Pulizzi: It really is. The most amazing thing, just to kind of wrap up all examples … and I think there’s a total of well over 50 examples in the book, and I love them, because most of them started with nothing. They started to create amazing content consistently over a platform. But the one thing that we did, is when we did the interviews for the book and we look at each of the models, every one — and I’m not kidding you – every one followed the same six steps. They did it in different time frames, but basically, the same six steps. What’s the passion area? Define that first. What’s the content tilt? How are we going to build the base over time? How do we then harvest the audience? Then we move in to the diversification of, once the minimum viable audience is attained, we diversify into books or events or into social media channels or whatever. Then monetization. The same thing. And that’s why I believe that if somebody reads the book, they could take this model and actually replicate it. Learn from you and I and everyone else and do this if you follow these steps. It just blew me away. Actually, the most exciting for me is the simplicity of the model. It’s actually not complex at all. Like, if you go to building the base, it’s ‘pick one main content type in one main content channel. Consistently distribute content over time.’ That’s like mind-blowing. But that’s what it is. That’s what everybody did. It just blows me away. Brian Clark: Yeah, I know. We’ve both been talking this for so long. I think sometimes, “What’s not to get?” But I will say that the way you boiled it down in Content Inc., over time, you find ways to explain things slightly differently, and you’ll see the light bulb go up. So Content Inc. is released on September 8th. It is available for pre-order right now on Amazon. I think everyone who listens to this show needs a copy of this on their shelf. Other than my foreword, it’s a really good book. I’ve got to do the false humility here. Brian Clark: Let’s talk a little bit about the Content Inc. Summit. So we’ve got the big enterprise event, and companies big and small show up to Content Marketing World. But on the following day, September 11th, will be the Content Inc. Summit. I want to talk about an example, and this is a guy who’s going to be there along with me and you, John Lee Dumas, the podcasting mad man. I mean, literally, this guy’s story amazes me. Not because of where he’s at, necessarily, although that’s impressive, but just how he attacked the world of podcasting as his content channel. Maybe you can run through a little bit of how John exemplifies some of these six steps or maybe the early ones. I think what I love about John more than everyone else is that he does those monthly podcasts where he shares all of his financials. I dig that. Talk about some pure authenticity. It’s giving everything up. Brian Clark: Yeah. At Moz, Rand was the first one I remember who had that kind of ultra-transparency. We try to do it to a certain degree, but it’s hard. I think we’re a little more old-school. Buffer does that really well. But John, yeah. He just lays it all out there. Joe Pulizzi: Basically, he built an audience, and then once he built that minimum viable audience, he was able to sell. You’re going to be talking. I’m talking. We’ve got Matthew Patrick coming in, who — I don’t know if you’re familiar with his work on Game Theorists. He’s got 4.8 million subscribers and has built an amazing business. He’s like YouTube’s number-one go-to guy or go-to to figure out analytics for YouTube. He’s going to be on there. That was the hope. We’ll see. I think we’re going to get a really good crowd for it, but again, it’s a different audience that we’ve targeted. It’s on the back of Content Marketing World on Friday, 9 to 3. Brian Clark: Yes. I’m attending both, but tell us how this works. If you want to go to the Content Inc. Summit alone, is that possible? Joe Pulizzi: Yes. If you want to go to the Content Inc. Summit alone, actually, the easiest way to do it is just to go to the book site. Go to Content-Inc.com, and that’ll take you to the book site, and there’s a link right at the top for Content Inc. Summit. Just click there, and you’ll just go to the Summit site instead of having to go to Content Marketing World and go through all the other hoops. You don’t have to do that. Just go to Content-Inc.com, and you’ll go directly to that page, and it’s going to be a blast. Right now, of course, that’s where my passion is at, because I love to see these smaller businesses or entrepreneurs actually feel like they have a chance, and you and I both saying the same thing. You actually have a better chance in some cases that the one with all the budget money, because it’s so much more difficult in a large enterprise to do this. Brian Clark: Yeah. Okay, we’re going to link that up in the show notes as well for easy access. Joe, my friend, you know, every year, I give you a hard time about Cleveland, which you love. You love your city. Brian Clark: I’m looking forward to being there, and I’m really excited. I don’t know, after all these years, I still get fired up, and that’s a good sign, because if I don’t, I need to retire. Joe Pulizzi: Hey, man, you’ve been along for this ride. It’s hard to believe. Remember the first year, we were just hoping for a couple hundred, and I said, “Brian, would you please speak? I need your help,” and we had 600 show up that year. Now we’re going to be over 3,000 this year. Brian Clark: I know. That’s amazing. Joe Pulizzi: It’s hard to believe. Brian Clark: You put on amazing show. Every year I’m just like, “This is huge,” and yet — no names on this side either — I’ve been to a few shows where they were just horrible. I mean, everything was wrong. The speakers are not treated well. But you really put on a class show. It’s amazing. I know you work hard to do it, but you make it look effortless while wearing orange, I should mention. Joe Pulizzi: You know what, if you wore a little bit more orange, I think the world would be a better place as well. Brian Clark: I’m a Broncos fan now. Can I wear just a Broncos jersey, or is that going to offend your Browns sensibility? Brian Clark: I don’t mess around in downtown Cleveland. I just keep eyes forward. Joe Pulizzi: We still remember the drive and the fumble. Brian Clark: I know. You never get over that stuff. Joe Pulizzi: Oh no. We can’t get over it because we haven’t won a championship in over 50 years. Joe Pulizzi: It will ease all the pain. It’ll all be forgotten. So hopefully soon, because people are dying here. Brian Clark: I was going for the Cavs. God, I just want you guys to win something. Anything. Joe Pulizzi: It’ll happen. It’s certainly not going to be the Browns this year. But it could be the Cavs. Brian Clark: All right, my friend, thank you again. I will see you shortly. Everyone out there, seriously, for the price of the book, I think you’re going to be over-delivered with inspiration but also methodology, and I think that’s important. So Content Inc. Check it out. Joe, take care. Joe Pulizzi: See you soon, bro. Thanks for all your support. I wish it stuck, but it’s more descriptive than content marketing. I read the whole article but for some reason I still don’t understand the term content marketing Brian… Can you elaborate on that term for me a little please sir?? ?